Conceptual lid proposal viewed from Columbia Center. Click for a comparative view. Author’s Note: This post has been superseded by an updated proposal in another post, “Let’s Bury I-5: Redux”, dated July 5, 2014. Author’s Note 2: The latest and most detailed proposal is in a third post, “The Case for Lidding I-5 in Downtown Seattle”, dated December 4, 2015. When President Eisenhower envisioned a great road system connecting the far-flung cities of the U.S. he didn’t quite expect the engineers to plow through whole neighborhoods. But that’s what happened, and the legacy is the concrete ribbons that divide our cities to this day. An example is right here in Seattle with Interstate 5 running north to Shoreline and south to Tukwila for about 16 miles, dividing Downtown from First Hill, Capitol Hill from South Lake Union, and the U-District from Wallingford. Amid population growth and demand for residential and commercial development, now is the time to reclaim valuable land while mitigating a significant disturbance to urban life. The Federal Aid Highway Act of 1956 covered 90 percent of the cost of constructing the interstates.When Washington State began planning the route in the early 1960s planners said, “…this area contains older and less desirable buildings…from Marion Street to Denny Way — this section will traverse an area that needs improvement in appearance” (ironic emphasis added). Objections to the route were limited. Residents of First Hill organized the only noteworthy protest, decrying the anticipated consequences of pollution, noise, decreased property values, and isolation from Downtown. 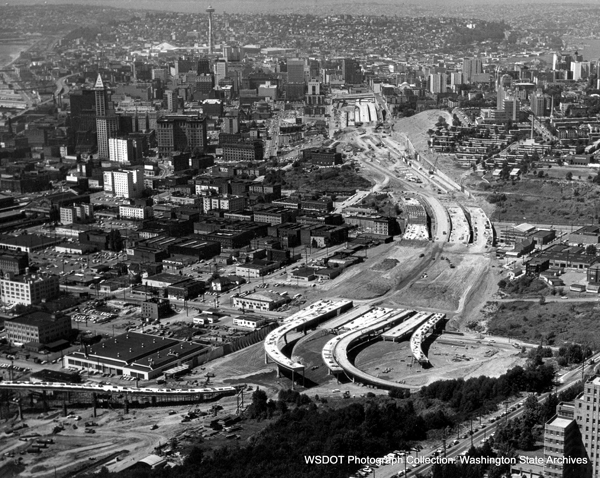 Paul Thiry, chief architect for the 1962 Seattle World’s Fair, suggested capping the freeway with a lid. But citizen opposition was ineffective, and the route went unchanged. Eminent domain was used to purchase and demolish hundreds of homes and businesses and create a right-of-way that opened to traffic in 1967. Freeway Park was a small concession to residents. Opened in 1976, its five acres of artificial landscape, walkways, and water features cross over I-5 from 6th to 9th Avenues between Seneca and Union Streets. However, the park’s brutalist architecture has a variety of nooks and crannies that give it a reputation for crime and injuries. The Washington State Convention Center, opened in 1988, is adjacent to the park and also stretches across I-5 with over 410,000 square feet of meeting and exhibit space. Further north in Eastlake, the unique I-5 Colonnade opened in 2005 with walking paths and dirt bike trails under the elevated lanes leading up to the Ship Canal Bridge. 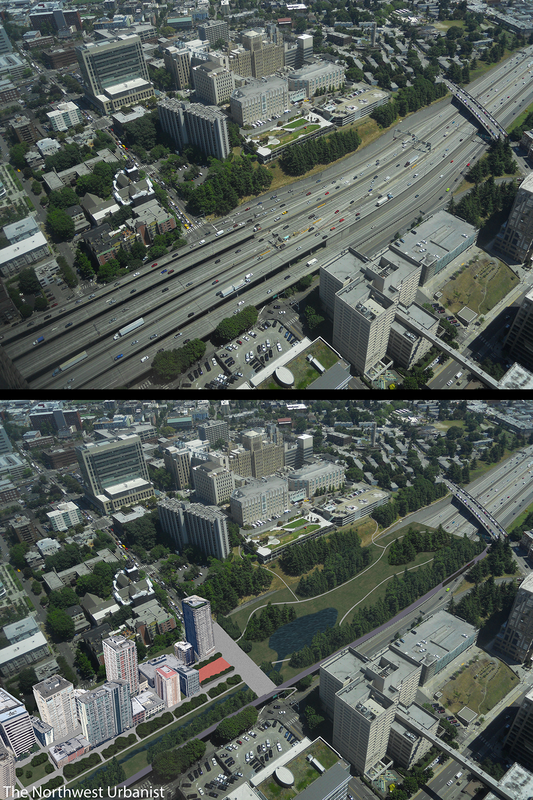 These examples provide clear precedents for building over and under the freeway, which will certainly require continued cooperation between WSDOT and the City of Seattle. The reasons for burying I-5 through Downtown are numerous. The noise, for one, is a major issue that makes for an unpleasant experience anywhere near it; even at my apartment in the U-District, I can hear the road noise from a half mile away. When I walked above the freeway in Downtown I registered a constant 80-100 decibels, which is similar to the noise intensity of a freight train or jet flyover. Exhaust fumes have negative health effects on people living next to the freeway, who tend to have lower incomes, and the noxious smell is especially obvious during peak hours when traffic backs up. There is also the aesthetic issue; I-5 is a gash through the heart of Seattle, which is a city that prides itself on alternative transportation and reducing single-occupancy-vehicle use. And amid the need for new housing, such a wide strip of underused land is increasingly attractive. 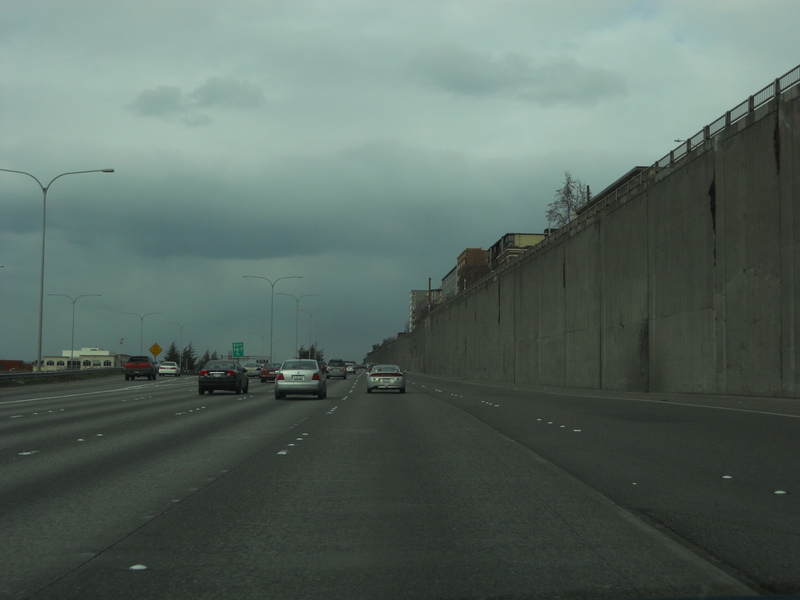 I-5 through Seattle has huge stretches of concrete paving and retaining walls that could accommodate better land uses. The big issue, as with any megaproject, will be cost. To begin with, infrastructure project costs are chronically underestimated due a variety of reasons (this paper succinctly discusses them), so what I write here are only educated estimates. But the Seattle area has a number of large public works underway, and the under-construction Highway 99 tunnel just a few blocks away is a convenient example. That tunnel has a number of components, including new surface-level paving and demolition of the Alaskan Way viaduct, but the underground activities have been allocated about $2.05 billion. At 2 miles long and 4 lanes, that comes out to about $1 billion/mile or $.25 billion/lane-mile. I-5 through Downtown is 14 lanes, including the reversible express lanes. Bertha, the tunneling machine working on Highway 99, is already the world’s largest with a diameter of 54 feet. To keep the same traffic capacity, an even larger machine would be needed for an I-5 tunnel, or four Bertha-sized tunnels would have to be bored side-by-side. The latter idea would have an estimated cost of $3.5 billion/mile. This is absurdly expensive, and does not consider the other costs of design, administration, and traffic delays during construction. A non-boring option is cut-and-cover, a method in which a trench is dug and a roof built overhead. But long term lane closures, which would be necessitated by this method as excavation is done in the right-of-way, would be politically and economically infeasible; I-5 carries some 250,000 vehicles and 50,000 transit riders per day (PDF) in Seattle and thousands of tons of freight up and down the west coast. Proposed 2.5 mile route of the lid. Click to enlarge. The best alternative, then, is to construct a lid over the existing lanes. Capping I-5 where it runs flat on the surface would only result in an unsightly concrete box, so a lid makes the most sense where the freeway is in a trench or protected by retaining walls. In much of Downtown, this criteria is met as the topography slopes uphill from west to east, and the lid can be built at an angle to match the slope. Ideally, the structure will run at least from Jackson Street to Denny Way, a distance of 1.5 miles. An extension to Galer Street in Eastlake would add another 1 mile; between there and the Ship Canal Bridge the freeway is elevated above the surrounding land, and in much of South Seattle the freeway is relatively level with the ground or not adjacent to dense commercial and residential areas. I-5’s right-of-way is 300 feet wide along this 2.5 mile corridor, so a lid covering the full length will create 90 acres of surface area. A low-intensity option for developing the new “land” would be recreational space. Bicycling and walking trails could extend the length of the lid and support commuters to Downtown, and if designed to support a thick layer of soil, a range of vegetation up to large trees could be planted to add a leafy new park to the heart of the city. A variety of other spaces can be incorporated too, such as playing fields and plazas for concerts and markets. Water features like fountains or even an artificial river could prove attractive in the summer, while covered pavilions and event space would be useful year round. The lid will provide a unique amenity to residents and may also draw in visitors. There are remarkably similar projects nearby. On Mercer Island, a half mile long lid over Interstate 90 was completed in the early 1990s. On top is the 20 acre Aubrey Davis Park, which has open space, playgrounds, trails, and sportsfields. The lid was proposed in the 1970s in response to citizen pushback; the mayor at the time said, “We don’t want to see it. We don’t want to hear it. We don’t want to smell it,” the same impetuses for this proposal. 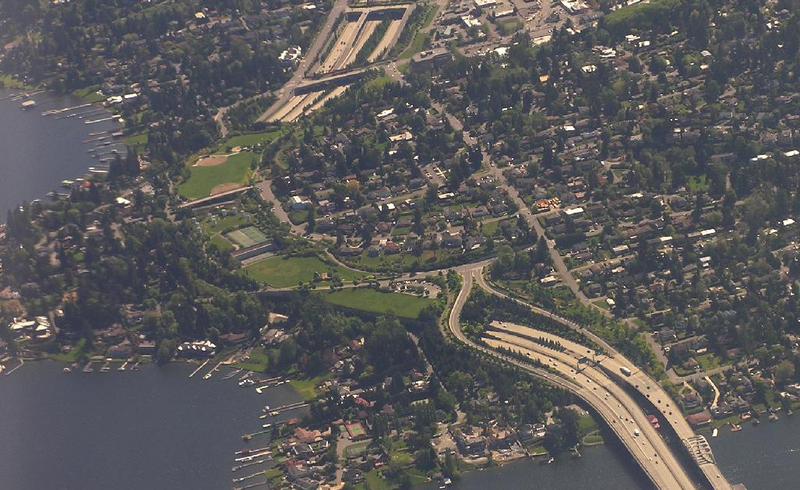 Another similar project is just across Lake Washington, where in 1989 Seattle’s Mount Baker neighborhood saw I-90’s surface lanes redirected into a tunnel and lid project. And residents of the Montlake neighborhood have successfully pushed WSDOT to build a lid over SR-520 sometime this decade after the adjacent floating bridge is rebuilt. The I-5 lid will require steel and reinforced concrete construction. If the cost is feasible, it could be engineered more heavily to support buildings up to perhaps 20 stories (or less; this is earthquake territory, after all) in addition to park space. There is a timely precedent for building tall structures on artificial foundation: New York City’s Hudson Yards development is going to be built over an active rail yard. Seattle is experiencing rapid population growth and increasing housing costs, so new apartments could help alleviate the affordability problem. There is also a growing demand for office space and retail space that could be exploited by developing commercial buildings on the lid. Recently, cities across North America have recognized the merits of covering up or tearing down freeways in their urban cores. A few years ago Dallas completed a similar project that built a 5 acre park over a downtown freeway. In San Francisco, planners are studying removing part of I-280 and relocating rail yards to open up some 27 acres for housing and employment (a conservative land value estimate is $228 million, or $8.4 million/acre). Philadelphia is developing concepts for capping I-95 with an 11-acre park (costs estimated at about $18.6 million/acre) and bringing people back to its riverfront with residential and commercial development. And a recent study in Toronto recommends tearing down a three-level expressway to make room for new development. A similar large scale projects include Chicago’s Millenium Park, which was built over rail sidings and parking lots. The lid may also support reconnected streets. Currently there are 12 vehicle crossings in the area proposed for the lid. This can theoretically be increased to 21 if the existing street grid is patched, though some routes will be too steep for vehicles or require complex earthwork that would disrupt parallel streets; these routes can instead be made pedestrian-only with stairs where needed. In fact, what may be preferable is closing some crossings to vehicles so pedestrians and cyclists can travel the full length of the lid in safety. To return to the cost question, a comparison can be drawn from the Mercer Island lid. The structure, ventilation, and soil cost $146 million. Considering that is $242 million in today’s dollars, the lid is approximately a half-mile long, and that stretch of I-90 is about 200 feet wide, an estimated cost is $20 million/acre (similar to the Philadelphia project noted above). Therefore, at 90 acres the proposed I-5 lid might cost $1.8 billion (with a B). Topography and building foundations will make this a much more challenging project, though, so that can conservatively be rounded up to a cool $2 billion. Looking north from the Yesler Street bridge. Would it be worthwhile? Land is extremely valuable in the Downtown and First Hill blocks around I-5; a rough calculation based on parcel data from King County, using a range of land uses and parcel sizes, revealed an average land value of $18.1 million per acre ($416 per square foot), which is actually close to the estimated cost of creating the new land. If the City and the State partner on design and construction they could potentially recoup costs by simply selling to developers. Financing could also come from a special assessment, which is a property tax on surrounding land owners who would benefit from this large public investment. Construction bonds (borrowed money) could be used, though this usually requires voter approval. State and federal funding is also entirely feasible. But there are benefits beyond finances. Environmentally, this heavily populated area around the freeway will experience significantly less noise and air pollution, while a lid-top park can create new wildlife habitat and reduce the heat island effect. Socially, residents will gain a new area to live, work, and play while having increased access between existing neighborhoods. And yet going back to economics, these improvements would certainly increase surrounding land values and therefore property taxes, which could help offset the cost. New development, if feasible, would expand the city’s tax base. Is it politically possible? Maybe. The region has a series of ongoing megaprojects that had to be approved by state and local legislators, so it’s not inconceivable they would support the I-5 lid. But recent engineering mishaps and lengthy delays may make Olympia wary of approving similarly ambitious structures, especially in such a vital corridor. A cost-splitting partnership with the City of Seattle, which would benefit most from the project, could be negotiated to assure hesitant legislators. There will inevitably be significant citizen opposition. The cost estimate is certainly daunting, but it is only half of the $4 billion Highway 99 tunnel and $4 billion Highway 520 bridge replacement. And unlike most large capital projects, the lid doesn’t have to built all at once; a bridge, tunnel, or stadium isn’t useful if it’s only half finished. The I-5 lid, on the other hand, could be built incrementally between street crossings, in standard sections of perhaps 300 feet long, or even just the spans between structural columns. This could be useful if full funding is unavailable or if the design needs to be tested. Construction will be disruptive, but working on nights and weekends will limit traffic impacts and the final result, which could last over 100 years, will be worth a year or two of inconvenience for a minority of regional commuters; interstate freight and through traffic could be detoured to I-405, though of course Eastside communities would also object to that. Safety, like in much larger tunnel projects around the world, can be ensured with emergency exits, exhaust ventilation, fire suppression systems, and round-the-clock monitoring from WSDOT’s control centers. The lost view from driving through Downtown will be balanced by covering up the freeway’s unsightliness and providing new views of the waterfront and Downtown’s towers from atop the lid. And height clearance, on- and off-ramps, and number of lanes will be preserved. Certainly, freeways are vital for moving people and goods in a country as large as the U.S., but there is little reason for them to disrupt our downtowns and act as barriers between neighborhoods. The proposed I-5 lid will create new valuable land for parks, residences, and commercial development, improve connections across Seattle’s most densely populated neighborhoods, and draw investment to surrounding properties. And perhaps most importantly, the lid will improve the environmental and urban character of the city’s core for decades to come. If this interests you, subscribe and like the Facebook page for future updates! This entry was posted in Editorial, Government, Housing, Land Use, Landscape, Megaprojects, Public Space, Transportation and tagged bicycling, bore, buildings, bury, cars, concrete, construction, cost, cover, Dallas, department of transportation, Eisenhower, engineering, freeway, highway, Hudson Yards, I-5, Interstate 5, land, land value, lid, megaproject, Millenium Park, neighborhoods, noise, park, paths, pollution, project, proposal, reconnect, Seattle, soil, tunnel, urban design, vegetation, walking, Washington. Bookmark the permalink. As soon as I win the lotto! Complicated-cost, design, politics, citizens, engineering, and traffic snarls. But could be worthwhile in the long run…I-5 is unsightly, loud, but necessary. Nice Job Scotty! The rest of the region needs safety improvements before Seattle gets another beauty project. Buildings would be tough, structurally. If we see any they’d likely be only a couple of stories. But park space would be good anyway if done well – it would be so large it would easily be our own Central Park. I have been to the one in Dallas. It made a huge difference. It litterally helped their “role up the streets” downtown connect with the up and coming “Uptown” to make it easy for people to go back and forth. A great park used for gatherings, music and for kids to play. They have a food truck (including a booze, beer and wine truck) day on Saturdays with tables in the park to eat. I personally think it would benefit all in Seattle. everyone would get lost because their gps would no longer work under the lid. Terrible air quality under the “lid.” XM radios would also fail, and people would crash as they scramble to flip to FM. Very difficult to clear multi-car pile-ups, of which there would be many. People in convertibles would have weird drips and odd dust fall down on them and get sick. What if your kids had to take a leak real bad? No bush to hide behind at the side of the road. Noise when an ambulance come through will hurt everyone’s ears. If you are wearing sunglasses, you will be temporarily blinded as you go into the tunnel. People with those glasses that darken and lighten according to the light? – might as well bury them right now… they are going crash. People with black cars… they are going to blend in the shadows. More crashes. Bands of predators will cause back ups in the tunnels then prey on the innocent people stuck in their cars. the People who died in crashes will turn out to be the lucky ones after that is all over. You, sir, are hilarious, and I hope that you write short stories/satire. I would probably read them. Glad to see this idea still has legs. I agree there are other infrastructure projects that may deserve precedence, but in the long run developing this concept in a way that can be phased over time in conjunction with other city improvement projects will go a long way to keep Seattle the vibrant and desirable place we love living in. I wouldn’t count on it paying for itself, though, so city/state officials, an accordingly. God this would be amazing. I would first build a lid between Pike & Pine, and use as much space as possible for new buildings, as tall as engineering allows. Since that area is so desirable, I think the upfront cost would be paid off reasonably quickly once those buildings rented/sold. It also would be less challenging than other locations because I5 is already below ground there. Absolutely. I think building it in segments would make the most economic sense. This. Crossing I-5 on foot is an embarrassment to the experience of living in Seattle, and the growth of Capitol Hill and SLU only means more of us will be subjected to it. Even a lightweight, plant-supporting mesh in this area would make a huge difference. Why not have a wide swath of park with smaller shops on either end? Essentially a market separated by a park. Freeway’s a waste of space in any case. Great idea. I’m working on something similar and would like to discuss the research you’ve done. It seems like robust steel and concrete construction is what makes lids expensive, so is there a lower cost solution? and what’s lost with that markdown (tall buildings, trees, soil…)? Wow spend spend spend, you libs think alike! People need healthcare ,mental healthcare, food and basic necesities and you people want to build more tunnels in an area that backfill and we are in a earthquake zone!!! Bertha is a mess and you fools want to make even bigger tunnels? I thought seattle had smart people loving here. Superficial libs , people need mental help here. Let’s make seattle affordable for people . drink the purple coolaid you sheep. You people disgust me.